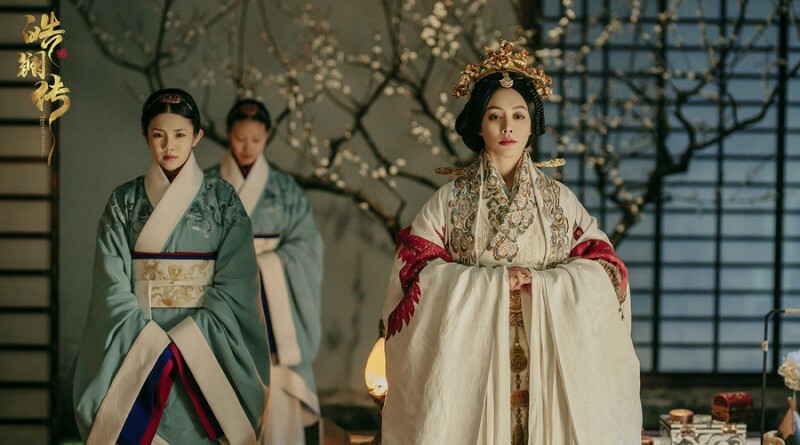 These are recaps of The Legend of Hao Lan Chinese Drama Episodes 5-6, Lu Buwei walks Hao Lan in the market, and she is interested in the Yao zither. He buys it for her and recognizes it belongs to Yi Ren. The servant sold Yi Ren’s zither for his treatment, he was furious to pass out. Note: From here on out there are specific plot spoilers for The Legend of Hao Lan Chinese Drama Episodes 5-6. Lu Xin asks Hao Lan to visit his house, but he isn’t there when she arrives. Lu Xin takes servants searching dancer’s rooms with the excuse of missing treasure. When Lu Buwei is going to stop his father, the servant finds the pearl in Hao Lan’s room. Lu Xin thinks Hao Lan stole his pearl and wants to send her to the jail. Lu Buwei sends Situ Que to take hound to verify who is the thief. Because the box which loads with pearl is made by spices, and the fragrance can stay for a long time. Lu Buwei asks the hound to smell the box, and smell everyone. The hound doesn’t react to Hao Lan, but barks at Yao Ji. Lu Xin fears to get punished, so he offers to end the case. But Hao Lan insists on punishing the thief. Lu Xin has to get Yao Ji out of the house. Hao Lan disclose that Lu Xin got her away, and asked Yao Ji to frame her. Lu Xin thinks Hao Lan is a witch and asks Lu Buwei to drive her away. Lu Buwei asks Hao Lan to apologize to his father. But she refuses it and blames Lu Xin united Yao Ji. Lu Xin is furious to ask Lu Buwei to make a choice between his father and Hao Lan. Lu Buwei tells Hao Lan to learn bowing, but she doesn’t want to be a Pekingese. So he walks her to the street and asks her to pay back the money she owes him. She agrees to dance but refuses to bow. Li He sees his daughter dancing on the street, and feels humiliated. But she claims she stands on her own feet. He announces to cut off their tie, and she is on knees to thank him for giving the freedom. Lu Buwei was intention to provoke Li He, so Hao Lan takes down her status. Hao Lan slaps Lu Buwei and reminds him to treat her like friend, but thanks him for getting rid of the constraint of her family. Lu Buwei decides to give up the chess piece of King of Zhao, and support Yi Ren to be King of Qing. Yu Hao sees Hao Lan staying with Lu Buwei, and swears to get rid of her. Li He tells people not to mention Hao Lan again when he returns home. Lu Xin asks Lu Buwei to drive Hao Lan away. Lu Buwei explains that he is intention to use Hao Lan to get the power, Lu Xin has to give in. Lu Buwei visits Yi Ren and brings present to his bodyguard General Gongsun. Yi Ren points out that Lu Buwei is intention to use him, and claims hostage and cannot satisfy his ambition. Lu Buwei invites Yi Ren to visit his store, but Yi Ren isn’t interested in it. Lu Buwei walks Hao Lan in the market, and she is interested in the Yao zither. He buys it for her and recognizes it belongs to Yi Ren. The servant sold Yi Ren’s zither for his treatment, he was furious to pass out. Yi Ren wakes up and sees Hao Lan playing his zither. He rejects it when Lu Buwei wants to return the zither to him. But he apologizes to Lu Buwei when Hao Lan wants to take the zither to leave. Princess Ya hears Yi Ren is sick, so she visits him. But she hears the music of the the zither, and suspects he has a girlfriend. So she interrogates General Gongsun and knows the woman is Lu Buwei’s dancer. Zhao Sheng picks some dancers to flatter King of Zhao. But King of Zhao misses Concubine Yun’s dancing. Princess Ya recommends Hao Lan to her father, so King of Zhao asks Zhao Sheng to get him the dancer. Hao Lan gives the ginseng to Yi Ren, and sees General Gongsun beating up the servant selling zither. The servant asks for forgiving, and returns the money to Yi Ren. Yi Ren asks General Gongsun to forgive the servant, and comforts the servant. Hao Lan thinks Yi Ren won’t obey Lu Buwei’s order as he is arrogant. The King of Zhao summons Hao Lan to dance in the court. Princess Ya sends a nice zither to Yi Ren since his zither was sold. But he rejects it, and blames her for sending Hao Lan to court. He thinks she treats him like a pet, and doesn’t want the suffocated love. Princess Ya is furious to throw away the zither. Princess Ya runs into Xiu Yu at the court, and mentions Hao Lan’s dancing. Xiu Yu worries that Hao Lan will get rid of her if she gets the power. Tai Bu visits King of Zhao and mentions the song which the child is singing. He thinks Hao Lan is a witch and wants to kill her. King of Zhao has to agree. Yi Ren visits Lu Buwei and wants him to save Hao Lan. But Lu Buwei isn’t at home. So Yi Ren thinks Lu Buwei is intention to avoid him, so he abuses him to be the evil businessman. He asks Princess Ya to save Hao Lan, and Princess Ya promises it. Yi Ren thinks King of Zhao will kill Hao Lan since Princess Ya is so calm. 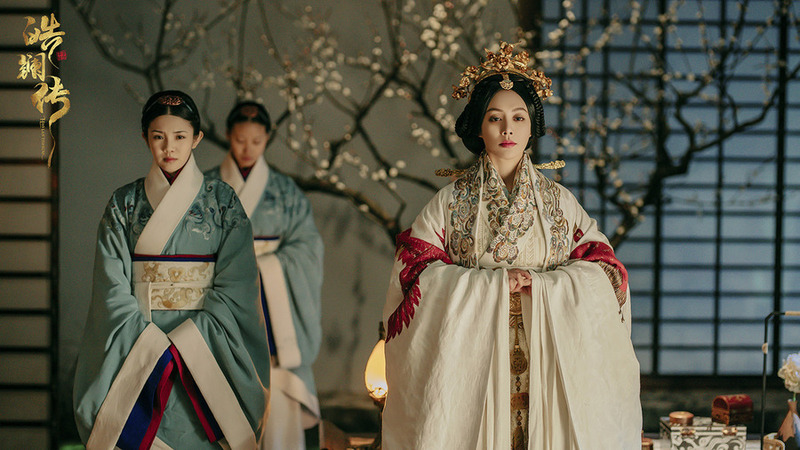 Gongzi Jiao suspects Xiu Yu paid money to Tai Bu framing Hao Lan, and slaps her. Hao Lan is escorted to altar, and Yi Ren gives her a bag of water. She drinks it and finds the pill inside. Zhao Sheng arranges Lu Buwei to see off Hao Lan. But Lu Buwei announces to give up her, and asks her to pray him when she is in paradise. He asks her to wear his robe. Xiu Yu sneers at Hao Lan and wears the robe for her. Hao Lan gives a penny to Xiu Yu and teases her that she is cheap. She finds the secret inside the robe, and knows what Lu Buwei means. Lu Buwei visits King of Zhao and claims the washing girl saw a white deer which means good luck. King of Zhao wants to summon the washing girl, but Gongzi Jiao drives her away. So Lu Buwei asks people to carry in the white deer. King of Zhao is happy to give the title of Shaofu Jian and sword to Lu Buwei, allowing him to walk in the court. Tai Bu sets up the altar, and Hao Lan jumps into the stove. But the stove explodes. Everyone is hurt, except Hao Lan. The robe turns into while one. She claims that she saw the deity, but the deity didn’t accept her and sent a angel with her. The angel is Tai Bu, and Hao Lan gives the fairy medicine to King of Zhao.